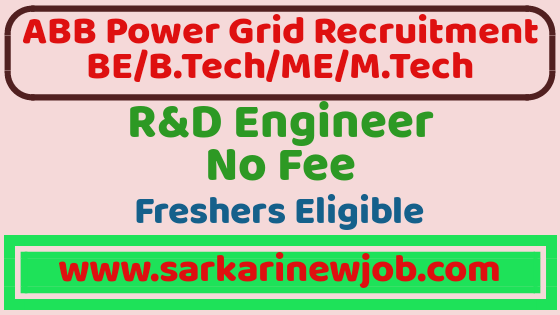 ABB (POWER GRID) Recruitment 2019 | BE/B.Tech/ME/MTech | No Fee | Freshers Eligible - Sarkarinewjob.com A ultimate job portal to provide employment news. Join ABB and work in a team that is dedicated to creating a future where innovative digital technologies allow greater access to cleaner energy. ABB is a global technology leader in industrial digitalization. ABB operates in more than 100 countries with about 147,000 employees and $34 billion revenue. In India, ABB has been operating for over a century. At present, we have 40 factories at 9 locations that develop best-in-class products bringing together global expertise, with local experience. India is also home to ABB group’s largest engineering design and R&D center, where our engineers work on cutting-edge technologies to develop the future offerings from engineering tools to analytics solutions. Power Grids Division delivers products, systems, service and software solutions as part of its comprehensive power & automation offering for the grid across the generation, transmission and distribution value chain – serving utility, industry, transportation and infrastructure customers. Power Grids offers its solutions through four business units that are grid automation and grid integration, high-voltage products and transformers. We are close to 3500+ employees in PG division. • Performing various electrical calculations like dielectric design, Accuracy calculation etc. • Preparation of project documentation like design report, DFMEA etc. • Preparation of product documentation like bill of material, material specification and process documentation. • Lead the local and global R&D team, good communication skills and experience on various technical document preparation. • Should have knowledge on manufacturing technologies, material knowledge, surface treatment etc. • Live ABB’s core values of safety and integrity, which means taking responsibility for your own actions while caring for your colleagues and the business. • Bachelor’s degree in BE/ME in electrical engineering. • Minimum 4 to 8 years of experience in Product Design & development of instrument transformer /Switchgear. • Basic knowledge of high voltage/ Electrical systems. • Working knowledge of IEC standards and type testing of Instrument transformer /Switchgear. • Hands-on experience in FEA tools. • Hands-on experience of 3D model/PLM tool like Creo 2.0, PDM Link and SAP. • Hands-on experience of drawing, BOM. • Manufacturing knowledge of Oil paper insulation and other process (casting, machining, sheet metal etc.). • Knowledge of Material and standards (ISO, DIN, IS).